At the time, I recall, the reaction was that I had “exaggerated wildly” and “stretched things out of all proportion” to make a point that was in itself quite outlandish, if not outright scaremongering. No way would our claim to Gilo ever be compromised and no way would any friendly force ever dare insist we curtail construction in so quintessentially an Israeli neighborhood. So a short while later, by way of defending my “peculiar predictions,” I elaborated on them in one of my Another Tack columns. “Too many professed Zionists regard settlers as enemies, frequently heaping more scorn upon them than on Arab terrorists,” I observed. “Settlers are often political pariahs, whereas it’s politically incorrect to refer to any Arabs as enemies. There are only potential peace-partners on the other side, and they can be placated with the sacrifice of a few settlements we’ve never been to, inhabited by folks we don’t wish to associate with. That was eight and a half years ago – almost a decade. Sadly my premonitions were vindicated. As Jews around the world ushered in the New Year, German Chancellor Angela Merkel, of all foreign heads of state, couldn’t contain herself and phoned Prime Minister Binyamin Netanyahu to vent about permits to construct 1,100 housing units in Gilo because, heaven forefend, Gilo is beyond that sacrosanct Green Line (and we all know what sticklers for the rules Germans, alas, are). 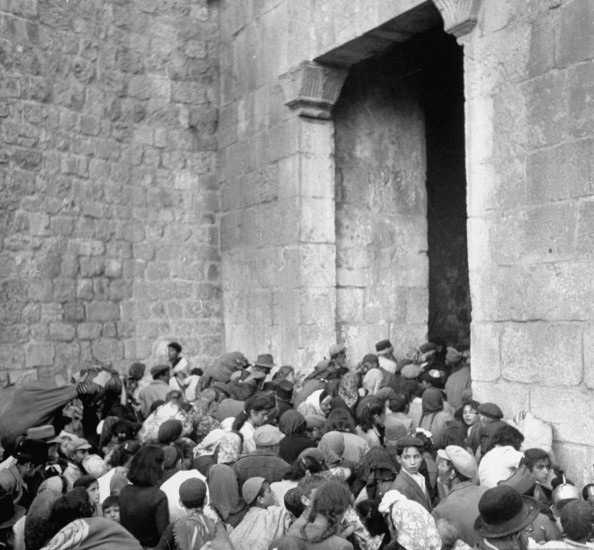 Expelled Jews shoved out of Zion Gate in the Old City of Jerusalem after the Arab conquest of 1948. This of course leads us to wonder why it was that Germans/Europeans kept so strictly silent when seven Arab armies forcefully defied 1947’s UN Partition Resolution that earmarked Jerusalem as a corpus separatum (separate entity), to be overseen by international administrators. Nobody squawked when, in violation of that resolution, Arabs besieged Jerusalem’s Jewish areas aiming to starve out and evict their inhabitants. Nobody complained when, in 1948, the Jordanians divided Jerusalem and occupied its east illegally. They remained for 19 years, destroyed 58 synagogues, sadistically despoiled the incomparable ancient Jewish veritable-pantheon on the Mount of Olives and denied Jews the right to pray at the Western Wall and other hallowed shrines. German cool and world composure were immaculately maintained as the Jordanians erected public urinals at Judaism’s holiest site to underscore the desecration and disdain. The Germans and the rest of the righteous international community stayed remarkably mum vis-à-vis the expulsion of every last member of the ancient Jewish community of Jerusalem’s Old City, which was rendered perfectly Judenrein (as per the then-recent German blueprint). Clearly Jews are perceived as portable and may be uprooted without excessive commotion. Indeed there was no global outrage until, in 1967’s Six Day War, Israel undid the Arab illegality (only following extreme belligerent provocation). 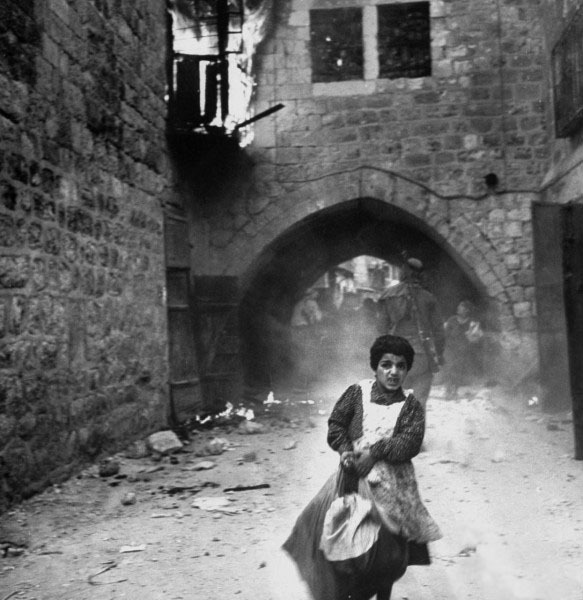 Only then did it emerge that the Arabs’ 19-year illegality was perceived as the legality that must be restored. It still is. Just ask Ms. Merkel. Arab conquest and barbarism must be rewarded and recognized by all decent onlookers as the status quo ante. Thus it’s forbidden to develop Gilo and avail Jews of housing in a city that was ever only their capital and theirs alone, in which their history dates back 3,000 years and where Jews constituted Jerusalem’s largest ethnic group as far back as the first obtainable testimonies and records of the earliest decades of the 19th century (borne out by noted travelers like Richardson, Carne and Scholtz). The first official census of 1844 showed 7,130 Jews and 5,760 Muslims in Jerusalem. By 1875 the number of Jews exceeded 12,000 and the Muslims increased to 7,560. At the outset of the 20th century the Jewish majority was incontrovertible – 45,000 Jews and 12,000 Muslims in 1909. 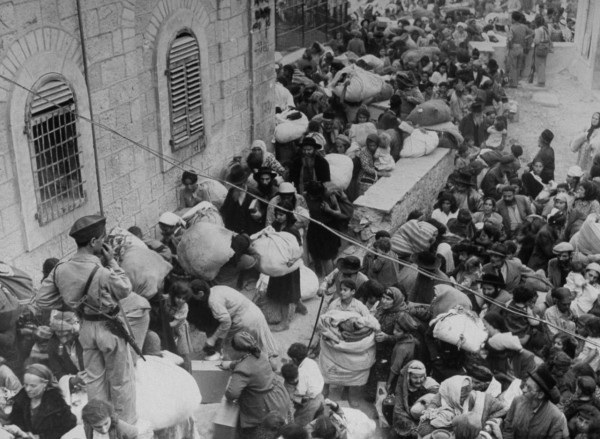 On the eve of the 1948 Arab contravention of the UN Partition Resolution and the Jordanian Arab Legion’s illegal occupation of east Jerusalem, the city included some 100,000 Jews and 36,680 Muslims. But facts won’t interfere with the expedient opinions of Merkel and her like. Netanyahu, therefore, made a tactical error when he retorted to Merkel’s meddling by stressing that “Gilo isn’t a settlement.” Thereby Netanyahu drew distinctions that the morally obtuse world anyhow doesn’t accept and never did. As I warned in my aforementioned then-disparaged “peculiar predictions,” our confidence in any artificial distinctions we make – and subsequently take for granted – is misplaced. If we renounce the settlements, we forfeit everything. Hence, Netanyahu merely amplified yesteryear’s fundamental errors. “…The attempt to sever Jerusalem from the State of Israel will not advance the cause of peace in the Mideast or in Jerusalem itself. Israelis will give their lives to hold onto Jerusalem, just as the British would for London, the Russians for Moscow and the Americans for Washington” – or the Germans for Berlin, as Netanyahu should have added for Merkel’s benefit. 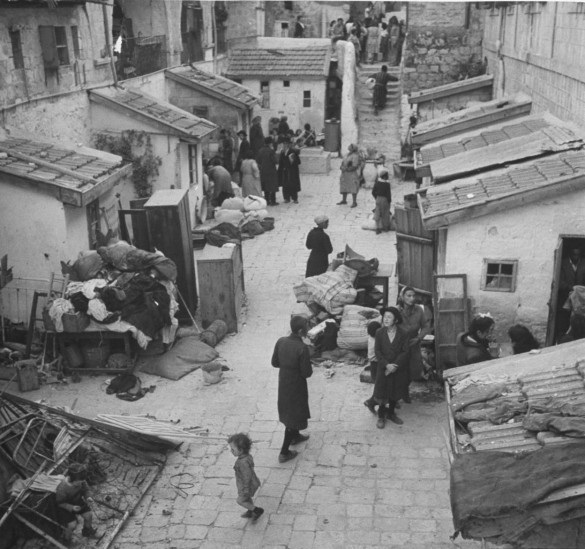 Before – an alley in the old city of Jerusalem in 1948, as Jews gather outside their homes, awaiting expulsion by Jordanian Arab Legion conquerors. 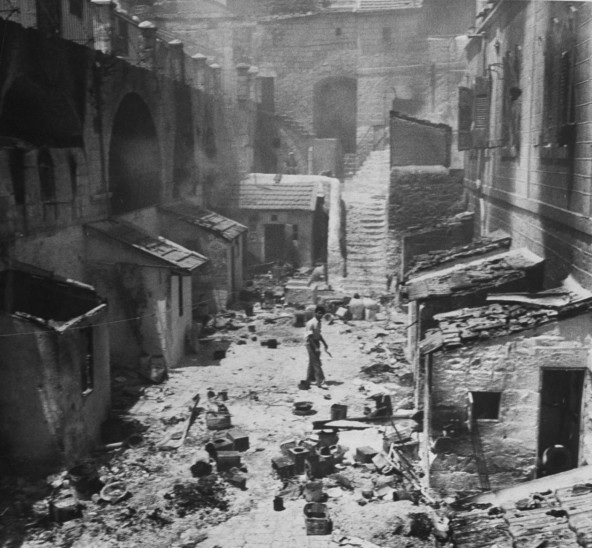 After – the same alley just shortly post-expulsion, littered with rubble after Arab looters ransacked Jewish homes. Settlers are, just like Liebermann and Netanyahu, Jews you are allowed to hate. And as a result people hate them with the deepest passion. What a different situation Israel would be in if Hamas had been soundly defeated and the IDF were not called to retreat before the job was completed. the idol worshiper Barak retreated. Michele Bachmann, one of the leaders of the Republican Party in the States and a great champion of Israel, has replied to a doubtful interviewer that she has “a spine of titanium.” No wonder she has been constantly hounded by the liberal US media. Netaniahu and his entourage would do well to watch that interview: perhaps there’s still a chance to remedy their spinelessness. Merkel is a two faced SNAKE, who promotes German trade ties with Israels arch enemy Iran…she clearly has NO business in lecturing Israel…she will also be thrown out of office fairly soon, as nobody in Germany takes her serious on any matter ! Israel should not fall into the traps of it’s enemies and use their foul propaganda language about settlements !!! There are just Jewish inhabitants of Israel, of Jewish land ! The EU fools would be well advised, to take a closer look at the ever growing no-go areas in their own cities…areas occupied by Muslim immigrants. Sarah, I hope you’ll comment on the prisoner exchange. Apparently, Hamas promises to take more IDF hostages. It’s such a good deal for them. The Israeli government should make it clear that the next time, They will pay 1000 for one! It’s time to change the rules about imprisoning captured terrorists who will be freed in exchange for hostages: take no prisoners. Just destroy them on the spot. These folks are primarily ARROGANT and GREEDY COWARDS who would sell their own granny to the devil, just to make a buck…these hypocrites are the least of the least to comment on the affaires of the Jewish state…according to their holy rules NOT ONE NAZI KILLER has ever been convicted by a German court…and now they are in staunch support of Iran and it’s ambitions to prepare for the nuclear Holocaust !!! David Beck 1 comment collapsed Collapse Expand Sarah is a true ‘Gem’, and unequalled in her ‘Perspectives’ which she so aptly transfers to the ‘Printed Word’. She teaches her ‘readers’, with a simplicity that one can comprehend, and the depth of her columns becomes a ‘lesson for those who wish to become knowledgeable of ‘the true and real history’ of our Jewish brethern vis a vis the belligerent world of Jew haters and Jewish revisionists. She is even more then what can be described. So even Ariel Sharon made mistakes that need to be fixed. He also spoke of “The West Bank” l9ike all the Israeli politicians that did it like sheep. I complained about from day one. Every time anyone speaks about “The West Bank.” They should have been corrected by saying you speak of Judea and Samaria. There has never been such geographical place in all of history. It is a little late but it is high time to start calling the homeland of the Jewish nation by it’s real names and not by names invented to deny any connection to the Jewish nation to it’s birthright homeland. What to expect if any part of Israel is rendered back to the savages, anti-Semitic, biased, Jew haters Arabs. Any attempt to chip any part of Jerusalem from the State of Israel will not advance any cause but the cause to harm Israel. It will not bring peace to Israel or make the Middle East a civilized region. It will do no good to Jerusalem either. Israelis must never entertain the idea of parting from one block of Jerusalem. Jerusalem is the eternal capital of the Jewish Nation, the center of the world. Just as the British would fight and sacrifice lives for London, the Russians for Moscow, Germans for Berlin and the Americans for Washington, Israelis must fight and sacrifice lives for Jerusalem, the holiest of holy to the Jewish nation. Netanyahu should always say: I am an Jerusalemite. It’s very simple, those who critize the jewish construction in jerusalem support the partition of Jerusalem, and no serious goverment can support the partiton of Jerusalem, because it is irrational and impracticable, how are you going to control who enter to Israel in a divided city? What they want is a diffuse border between Israel and Palestine, not a real border between jews and arabs, arabs coming in and coming out of Israel everyday, a corridor from gaza to the west back et al… so all those israelis who think that creating a Palestinian state will get rid of 3 millions of arabs ARE WRONG, it will be the current situation, but much worse, because Israel will lose any control of the situation and instead of 3 millions it will be 6 millions or more. IT WILL BE A BOTCH ,papering over the cracks, IT WILL BE KADIMA, J STREET, SOROS, NIF and all that cancer for Israel. It makes furious when Israeli politicians call Judea and Samaria the invented name “The West Bank.” Why?